On this journey from scattered to sane we’ve been working at hard at creating a structure for our time. 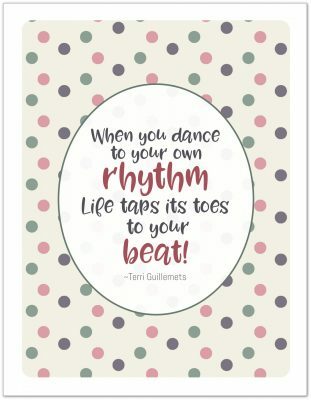 Creating routines, setting priorities and working with our planners to keep us on track have all played a role in helping us to begin to reclaim our lives (or at the very least, take back our time). Sometimes though, all this structure can have the opposite effect of what we’re aiming for. Too much structure can result in feeling confined or worse can lead to use feeling more overwhelmed by all we need to do. There is much to say about how having room to breathe and to just be. So today I want to touch on why unstructured time is so important. Remember when you were a kid on school breaks and after a few days the novelty of not being in school would start to wear off and boredom would start to creep in? I don’t know about you, but my friends and I always ended up coming up with the BEST games and ideas during those times of boredom. One minute we’re bemoaning summer break for all its boring stuff and then next we’re having fun, laughing and swearing that this was the best summer break ever! Did that ever happen to you? There is magic that happens when we get bored or when we have nothing we need to do. Our brains get a chance to power down and our creativity comes out to play. Just like how kids need unstructured play time, we as adults need unstructured time too. I know it seems counter intuitive to what we’re working towards, but planning for unstructured time is going to be hugely beneficial for you. Unstructured time is just what it sounds like, it is time that has no set purpose. I know it’s hard to see the benefit from making room for this in our busy schedules, especially when we’re feeling scattered, but doesn’t it sound like a wonderful treat? Time in day when you don’t have to worry about what comes next? Time each week to just do whatever you feel like doing? If that isn’t enough to convince you, how about taking a look at some of the other benefits. I already mentioned one of the bigger benefits of unstructured time – getting the creative juices flowing. Even if you’re not a creative type, this is still something that is important to foster. Our creativity helps us in so many ways in our lives. From problems solving to coming up with a new family favourite recipe, creativity is sprinkled throughout all that we do in a day. We need to give ourselves a chance to allow it to recharge and flow without direction. We’ll be able to come at new situations with fresh perspective. 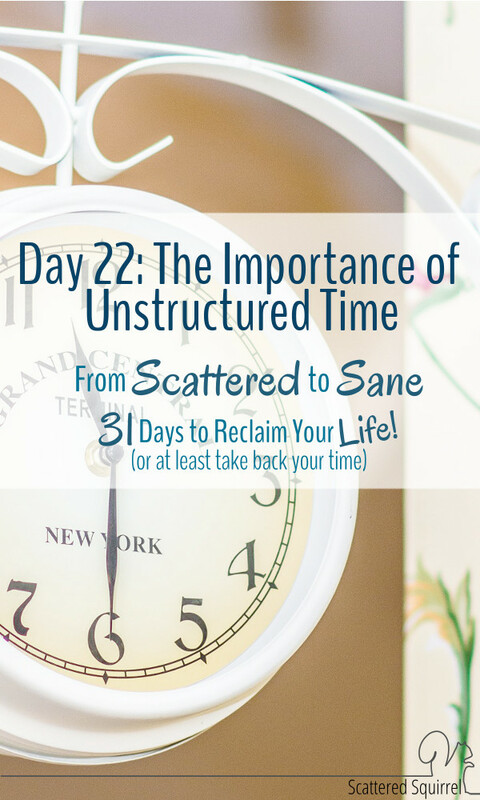 Another wonderful benefit to unstructured time is that it creates a grace period in our days or weeks. A period of time when there are no expectations to live up to, no task waiting to be done. We can just simply allow ourselves to do whatever pops into our minds. Read a book, tidy the living room, take a nap. Whatever feels right. As kids, times of boredom lead to wonderful new adventures; as adults, this free time can lead to wonderful bouts of productivity. Have you ever tackled one of those spur of the moment projects and ended up getting so much more done that you planned? Your junk drawer is driving you nuts so you decide to empty and organize it, which leads you tidying up the tools, or cleaning out the other drawers in the kitchen. Before you know it a whole hour has passed and you stop to find you’ve gotten a whole lot more done that you would have if you’d planned to do all that. That is the kind of snowball effect unstructured time can have. It also allows room for the unexpected things that crop up. A friend needs to talk, or a relative pops in from out-of-town. Your little one came down with a bug at school and needs you to come get them. It allows room for spontaneous joys like a spur of the moment road trip to a local attraction. A trip to the ice-cream story. Impromptu story time cuddled up on the couch. Most importantly, this unstructured time reminds us that there is so much more to life than what we do in a day. When we’re feeling scattered and like we have no control over our time it can be really hard find the justification in making time to do nothing, but it’s really important that you do. You deserve this! So, your homework today is to sit down and figure out where you can fit unstructured time into your day. EVERY day! Even if you can only spare 30 minutes now, I want you to block that time and use it to do whatever you want or feel you need to do. No planning what you’re going to do during that time, just plan to have that time set aside. If you can’t manage time every day then set aside a good chunk on the weekend. Be bold and give yourself a whole day every few weeks or months. I do this once every month or two, I call them my Scattered Days. It is amazing how much you can accomplish when you strip away your expectations. 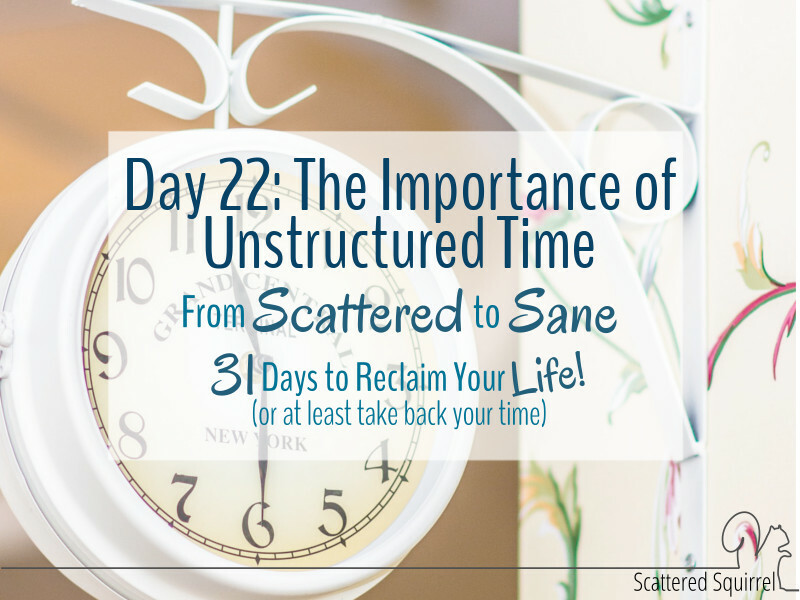 Can you fit unstructured time into you day today?